Buying tip: Look for strong certifications and committed brands. Certification Labels – These are labels that require a third-party audit to verify that a clear set of established standards has been met. Membership Organization – Membership organizations verify that a member’s mission and practices meet a certain set of values or membership criteria. 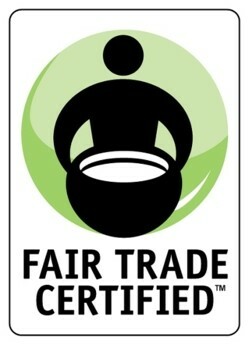 These are the strong fair trade labels that are third-party certified that benefit farmers in the Global South. 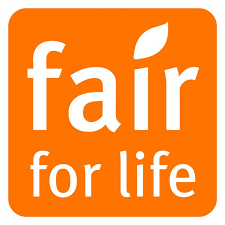 Fair for Life is notable for its exclusion of brands with any un-remediated history of labor and environmental exploitation. This policy, along with a high threshold of ingredients required to use a label, strong environmental standards that encourage organic or equivalent practices, long-term commitment from buyers, requirement for physical traceability of ingredients, and the requirement that brands continue to increase purchases of fair trade ingredients and materials collectively ensure that the label is only available to those brands most committed to fair trade practices. FFL also guarantees prices above market averages and supports direct producer negotiation of prices. Fair for Life has less focus on democratic organizing than some other programs and lacks producer representatives in governance. Despite those shortcomings, Fair for Life is a recommended label for small-scale producer fair trade based on its strengths. Note however that for large-scale production, Fair for Life lacks the enforcement mechanisms needed to ensure its standards are upheld. The Fairtrade System – Producers have a strong role in governance and decision-making bodies of the Fairtrade System and democratic organization is required at every level of the program. This producer participation includes producer groups setting global minimum prices for fair trade products. The Fairtrade System also contains many of the elements expected of fair trade programs, including requiring transparency about future sourcing needs as a show of good faith of long-term commitment, support of the general assembly as the highest authority of a farmer association, and strong requirements for gender equity. Allowing brands with ongoing human rights and environmental violations to use the label and allowing the label on products with as little as 20% ingredients certified are shortcomings that could result in greenwashing. However, because producers have a strong role in determining standards, which has led to strong standards overall, the Fairtrade System is a recommended program. The Fairtrade System excludes large-scale operations in many crops from certification to protect the markets of smallholders. For large-scale operations that are eligible for certification, the Fairtrade System does have strong standards and enforcement mechanisms. Naturland Fair is owned by its farmer members, excludes brands with human rights and environmental violations from participating, requires environmental standards that exceed organic requirements, has a high threshold of certified ingredients before label can be used, and prioritizes marginalized small-scale farmers. Naturland Fair is a strong fair trade label. SPP is the only fair trade label developed exclusively for and by small-scale producers in the Global South and that excludes individual large farms. It is notable for its focus on building capacity of the small-scale producer sector and the commitment required by brands that use the label to not only meet a code of conduct for all business practices, but also to continue to increase purchases of SPP products. SPP is less specific and rigorous on labor and environmental requirements than some other programs, but is recommended as a label focused on small-scale producers. These labels are the strong worker justice or fair farmer labels that benefit small-scale farmers in the Global North and/or farmworkers in any region. These labels complement traditional fair trade labels. Agricultural Justice Project (AJP), founded by farmworker and farmer organizations, sets standards for the Food Justice Certified label, a U.S.-based program with criteria for farmers’ relationships to farmworkers and buyers’ relationships to farmers. The label has high standards in most areas and farmworker representatives involved in both program governance and on-farm monitoring and enforcement. Both farmers and farmworkers benefit from this program. The Coalition of Immokalee Workers (CIW) sets standards for the Fair Food Program (FFP), a program developed by and for tomato workers in Florida that has expanded its model to other crops and locations. Fair Food Program is a farmworker-led program with a strong mechanism for reporting, investigating, and reducing labor abuses. Equitable Food Initiative (EFI), a collaboration of stakeholders including labor unions, NGOs, and corporate buyers, sets standards for the Responsibly Grown, Farmworker Assured label, a certification focusing on social and food safety criteria. EFI has the goals of worker empowerment and increasing wages. Farmworker organizations are founding members and auditors and leadership team members must undergo extensive training. However, there is less emphasis on democratic organization of workers and on wages than some other programs. These are labels that make claims to benefit farmers or farmworkers but have significant shortcomings in either the standards or their enforcement. Fair Trade USA’s fair trade label is a third-party certification system with some strong standards, but also significant shortcomings. Similar to the Fairtrade System, FTUSA allows brands with ongoing human rights and environmental violations to use the label and allows the label on products with as little as 20% ingredients certified, both of which are significant weaknesses. However, unlike the Fairtrade System, Fair Trade USA is neither owned nor governed by producers, which makes these weaknesses even more concerning. Other notable gaps in standards include a lack of required long-term commitment by buyers, lack of requirement of democratically organized entities, no guaranteed producer input into pricing, and no safeguards to protect markets for smallholders. Fair Trade USA also allows large-scale operations to be certified without regard to unfair competition created for small-scale farmers and without effective enforcement mechanisms. Its apparel program allows for the use of a label even if only one of the stages of production is certified and does not require fair trade cotton. Rainforest Alliance has some good standards, but is missing key elements such as increased wages for workers and lacks the enforcement measures to ensure compliance even where standards are good. Rainforest Alliance is often confused with fair trade, but it is not a fair trade label. continuing to sell the highest quality coffee on the market. The Domestic Fair Trade Association (DFTA) is a collaboration of organizations representing farmers, farmworkers, food system workers, retailers, manufacturers, processors, and non-governmental organizations. DFTA’s mission is to create fair and equitable supply chains. The organization has developed principles of domestic fair trade that mirror the established international fair trade principles. The Fair Trade Federation (FTF) is the trade association that strengthens and promotes North American organizations fully committed to fair trade. The Federation is part of the global fair trade movement, building equitable and sustainable trading partnerships and creating opportunities to alleviate poverty. The WFTO is a global membership organization for committed fair trade producer groups, retailers, wholesalers, and fair trade brands. Membership of the WFTO is limited to organizations that demonstrate a 100% fair trade commitment and apply its 10 Principles of Fair Trade. WFTO members must participate in its Guarantee Program that combines peer review with third-party audits and then may use a WFTO Guarantee label on products, making WFTO the only fair trade membership organization to require third-party auditing of supply chains.